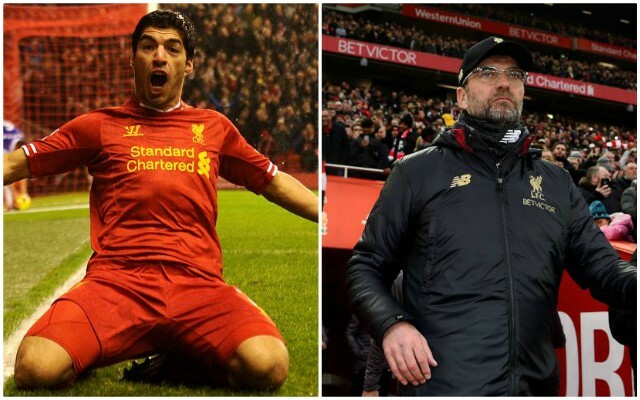 Luis Suarez admits he holds an eternal connection with Liverpool following his spell at the club between 2011 and 2014. The Barcelona star came as close as any Liverpool player in the modern era has to winning the Premier League title when he starred for the side that finished runners-up in 2013/2014. Suarez scored 31 goals in the league in what would prove his final season at the club as Manchester City finished champions by two points. His stunning campaign has since seen him recognised as one of most technically gifted players to ever put on a Liverpool shirt. He has now spoken of his admiration for Jurgen Klopp’s current league leaders, as well as touching on a common interest amongst players to work with the German. Though the chances of Suarez ever returning to Merseyside are extremely slim, it’s impossible not to relish in the thought of the Uruguayan featuring in Klopp’s current setup. From the ferocity of his pressing to the ingenuity he boasts in the final third, the 31-year-old would arguably be a perfect match. For a player of his calibre and success to think so highly of Liverpool’s style is yet further testament to the impact Klopp has had in enhancing Liverpool as both competitors and entertainers. The Reds now have 15 league games left to see if they can go one better than the former no.7.